Position motion-sickness prone kids in the back seat. Motion sickness is no fun, no matter how old you are. 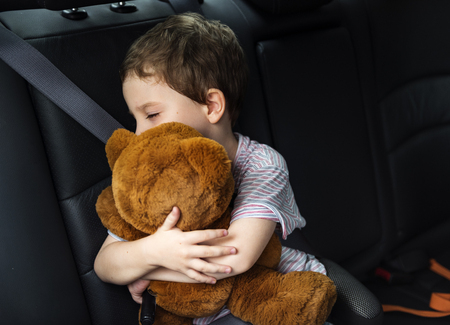 If there's a road trip in your future, and one of your little passengers is prone to tummy trouble on the road, the best thing to do is to be prepared with ways to minimize the discomfort - and to deal with it if the worst comes to pass. Here are 9 ways to help keep your kids’ tummy contents where they belong, and help keep motion sickness at bay. Position motion-sickness-prone kids in the middle of the back so their eyes are directed straight out to the road. Kids often get sick when what they're looking at (a book or the scenery whizzing by) doesn't match the motion that their bodies feel. If they still feel motion-sick, suggest that they focus on something motionless and far away, like the horizon. Don't let kids read in the car, especially on windy roads. There is something about the mix of printed words on a page and a serpentine road that don't agree with most people. To avoid nausea, sing along to the radio or listen to books on tape. Open a window and let a little fresh air in at the first sign of motion sickness. Fresh air does a big - and little - body prone to becoming car sick good. This could prevent a full-fledged tummy episode. If there's a history of car sickness, keep pre-road trip meals light. This trick will go miles toward helping an uneasy stomach keep its contents within. Provide cold ginger ale for sipping and crackers for nibbling. (Here's a great reason to keep a small cooler in the car.) These on-the-road tummy settlers can save the day - or night. Not to mention your car's interior. If a child is feeling car sick, put a wet, cold cloth over the child's face. This cool comforter can calm her system down. And if that doesn't work, you'll just happen to have a bag handy. Pack an ice scraper (great for scooping up chunks, ick), motion-sickness bags (a.k.a. plastic trash bags), and wet wipes for quick cleanups. Have a change of clothes for the motion-sickness-prone child handy. If it happens, you'll be ready to remove clothes and utilize the fresh replacements. Finally, if your kid is likely to get car sick, ask your doctor about giving him or her a safe medication for kids that contains Hyoscine before the trip begins. Remember that it doesn't start working immediately, so medicate before the motion starts.